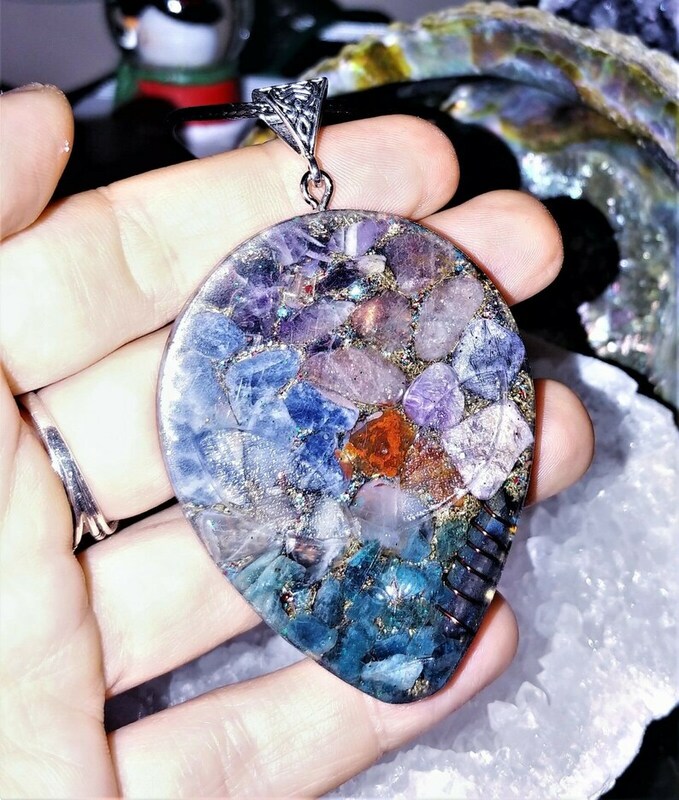 It contains Rainbow Aura Quartz wrapped in copper wire, Charoite, Sodalite, Blue Apatite, Amethyst, Moonstone, Red Aventurine, Carnelian, Shungite powder, Pyrite sand, copper coils, mica, 24 k gold leaf, tesla coil, red copper coils metal shavings, Reiki healing energy, Love and Light, 528 Hz frequency. Red Aventurine enhances creativity, prosperity, diffuses negativity, and balances the male-female energies. Red Aventurine can also help to ground excess energies within the body. Simply hold a piece of Red Aventurine, place your feet flat on the floor, visualize forming a connection with the earth and allow the energies to flow down through your feet and into the ground. Physically, Red Aventurine benefits the thymus gland and nervous system. It helps to balance blood pressure and as an elixir can aid in skin problems. Red Aventurine assists in the area of fertility, reproductive organ issues, cancer and hormonal imbalances. It is also useful for absorbing electromagnetic smog and other environmental pollutants. Use Aventurine to grid your home, gardens, offices and sacred spaces. Apatite is a stone that mystically can stimulate the thoughts and ideas. It is used, often in conjunction with meditation, to increase intellect, imagination, and intuitive and psychic awareness. It is said to help you maintain focus, learn, concentrate effectively, think clearly, and communicate better. Apatite is a powerful meditation or psychic awareness tool. It can clear the aura, enable spiritual attunement, and bring powerful psychic awareness. Apatite is used very successfully mystically for lucid dreaming, deep meditation, astral travel, past life work, rebirthing, and inner wisdom. It is a stone that promotes psychic communication, clairvoyance, and clairaudience. Apatite can be used to enhance the energies of other crystals and stones. Apatite is primarily related to the throat and third eye chakras. Moonstone is said in crystal healing to help calm responses and stress, and avoid overreaction. It brings hope, enhances feminine energies, sensitivity, intuition, and psychic abilities. It is also said to bring strong energies of abundance to one's life.Moonstone is a stone of protection. It is a stone of calm and relief from emotional stress. It is also associated with love of all kinds. Physically moonstone is used in crystal healing to aid the pituitary gland and digestive system, obesity, water retention, hormonal problems, menstrual problems. Note that healing crystal meanings are spiritual supports to healing and are not prescriptions or healthcare information. Moonstone is also used as a stand in for pearl, when pearl is not available. Moonstone is associated with the crown and third eye chakras, and sometimes with the heart chakra.